This Reaper Miniature is entitled Mia of the Blade, 02293, sculpted by Sandra Garrity and contains one 25mm scale unpainted metal miniature(s) from Reaper’s Dark Heaven Legends miniatures line. This Mia of the Blade Reaper Dark Heaven Legends miniature comes unpainted and may require some assembly. The cubed shaped M in the photo shown against Mia of the Blade is approximately 1/4” 6.25mm in size. This gives you a good indication of the size of Mia of the Blade. What are Reaper Dark Heaven Legends Miniatures? 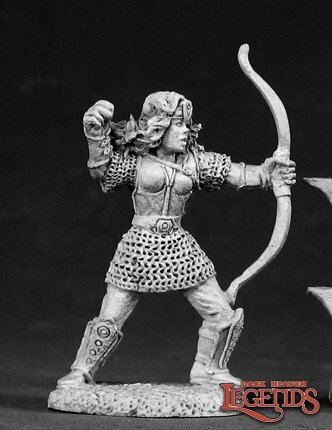 Mia of the Blade is from the Dark Heaven Legends line of Reaper Miniatures. These minis are made from metal and unpainted even if shown as painted in the photo. 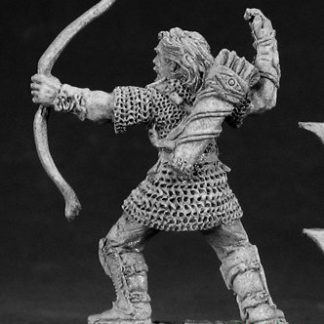 25mm Heroic Scale Fantasy Miniatures. Amazing detail from the best sculptors. Unpainted metal models that may require assembly. Huge selection of classic humans and monsters for fantasy RPG players. Usually come with an integrated brocolli base moulded onto the metal miniature. Reaper Miniatures is a leading hobby and adventure industry company. Our primary focus is the design and manufacture of pewter miniature figurines, paint and accessories for hobbyist around the world. Reaper Miniatures was organized by four talented individuals who wanted to create, and be part of, a company that was both exciting and challenging. Founded in Ft Worth, Texas on July 4th 1992, Reaper Miniatures quickly established itself as a leader in pewter miniature design and production. 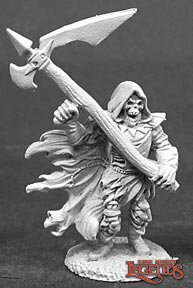 From its inception, Reaper Miniatures has worked closely with artist, sculptors and writers to create a community of endless adventure for consumers around the world.